In the April 2014 general elections the ruling conservative coalition of the Fidesz and KDNP parties prevailed, keeping its two-thirds majority in parliament for the time being (133 of 199 seats). However, in early 2015 the ruling coalition lost its two-thirds majority in a by-election. The Orbán administration has repeatedly taken actions that led to confrontations with the EU commission and its EU peers. Among them were a controversial media law and some constitutional amendments that were criticised by the EU commission as curbing the independence of the judiciary. Some of the original initiatives were later changed and diluted after the EU commission warned Budapest that those new laws would be incompatible with existing EU laws, and that it would resort to legal action unless changes were made. The most recent controversial action by the Hungarian government was its decision to start building a fence on the border with Serbia and changing asylum laws to be able to deport migrants more easily. Together with some unorthodox economic policy decisions like additional taxes on banks, the government’s repeated confrontations with the EU have led to some uncertainty among its European peers and international investors about the reliability of Hungary as a political and economic partner. 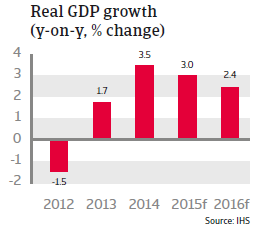 Hungary´s GDP growth accelerated to 3.5% in 2014 after 1.7% in 2013, as household demand grew, investment recorded a major year-on-year increase and both imports and exports increased further. At the same time, the government had implemented some controversial measures to encourage economic growth, including a series of mandatory utility tariff cuts, and one-off taxes on specific sectors. 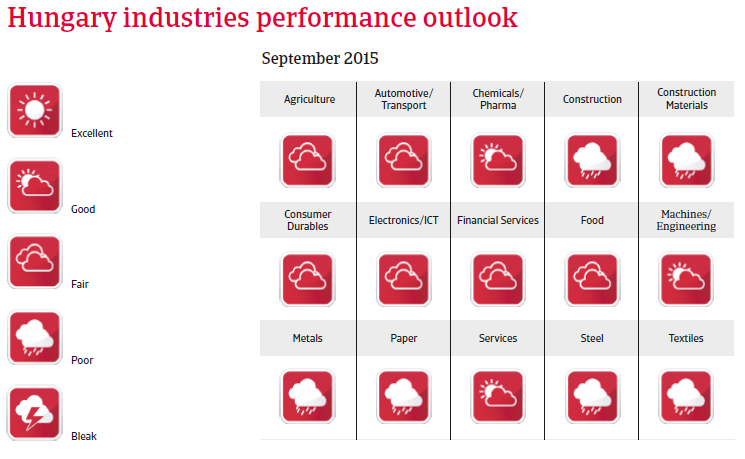 Economic growth is expected to continue in 2015 and 2016, although at a slower pace: by 3.0% and 2.4% respectively. The trade surplus is expected to decrease in the coming years as import growth is expected to outpace export growth. Unemployment grew from a 2008 pre-credit crisis level of around 7.5% to more than 10% in 2012, but since 2013 it has started to decrease, and is expected to decline further in 2015 to 7.2%. However, so far the rising employment rate is largely a result of individuals registering for public works programs, while job creation in the private sector has remained weak. Between mid-2012 and mid-2015 the Central Bank of Hungary repeatedly (29 times) and decreased the benchmark interest rate, from 7% to 1.35%. This has been part of its monetary easing policy in order to counter decelerating inflation and to spur economic growth. However, in July 2015 the Central Bank announced it will end the cycle of interest rates cuts and keep the current 1.35 % interest rate for a longer period. After 0.2% deflation in 2014 (mainly due to regulated household energy prices) consumer prices are expected to grow again, by 0.8% in 2015 and 2.7% in 2016. As an additional measure to spur economic growth, the Central Bank has provided 1.5 trillion forint (EUR 4.8 billion) in interest-free loans to commercial lenders since 2013 to boost credit to small and medium-sized companies. The government has proven committed to fiscal discipline so far. Hungary exited the EU’s excessive-deficit procedure in 2013, and containing the budget deficit within 3% of GDP is a top priority of the administration in order to avoid EU sanctions. However, since 2010 the government has been using unorthodox ways to balance the budget, most notably extraordinary taxes on banks and utilities. 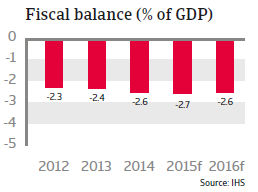 The budget deficit is forecast to remain below the 3% threshold in 2015 (2.7% of GDP) and 2016 (2.6% of GDP). However, Hungary still has a very high level of public debt. In 2011, the public debt to GDP ratio peaked above 82%, and has decreased only moderately since then, to 76.9% of GDP in 2014. The forecast for Hungary’s public debt reduction remains pessimistic, partially due to a deal the government struck with Russia in early 2014 for the funding of a nuclear power plant in Hungary. A EUR 10 billion interstate credit agreement with Russia to finance this project will be a large burden for public finances for decades, decreasing the chances for significant public debt reduction. Hungary’s major weakness is its high level of external debt. 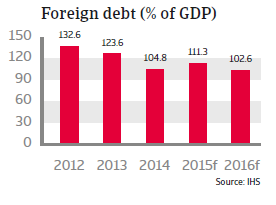 After peaking at 155% of GDP in 2009, Hungary has at least brought its foreign debt level down to 105% of GDP in 2014, which nevertheless remains very high. A large share of it is foreign currency-denominated, which exacerbates the problem, as a weak forint hurts many Hungarian households and businesses whose loans are denominated in foreign currencies. Therefore, Hungary remains highly vulnerable to international investors sentiment and currency volatility. The government has started to take measures to reduce Hungary’s dependence on foreign financing such as exchanging foreign currency-denominated debt for forint-denominated debt. But while the lower external exposure may improve Hungary’s risk profile on international financial markets, such a policy could increase the risk of a decrease foreign lending and private investment. Since 2011, the forint has further weakened against the euro as a result of the monetary easing policies by the Central Bank as well as uncertainty over Hungary’s economic policies and public finances. The forint strengthened in early 2014 despite the continued monetary easing, because of improved international market sentiment and better domestic economic conditions, but nevertheless it has remained volatile since then. 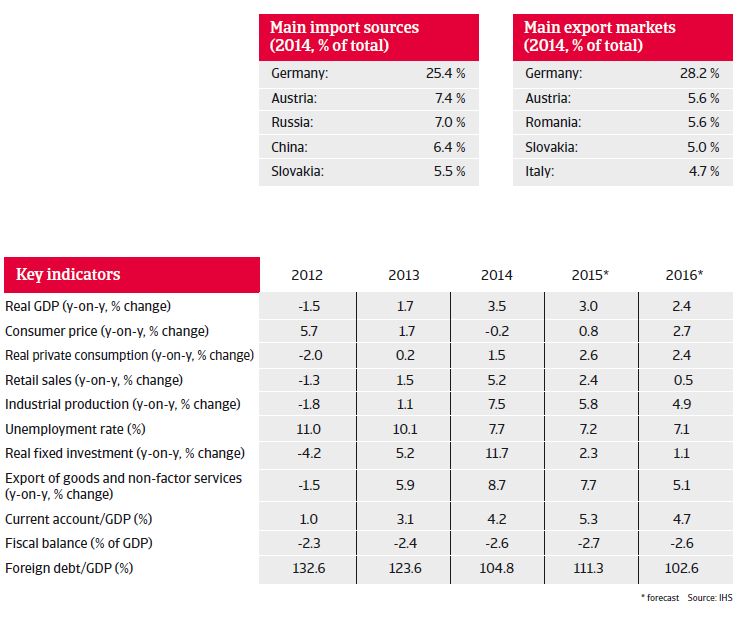 Hungary´s current account balance has moved into surplus since 2010, up to 4.2% of GDP in 2014. Prior to the 2008 credit crisis, Hungary had large current account deficits, but this has improved significantly since 2009 due to decreasing imports and a quick recovery in exports. The current account is expected to remain in surplus in 2015 and 2016.